A survey of recently married people shows that 17 percent of the people that participated met their wives or husbands online. Some say that means that 83 percent did not, so the result is not relevant. To me, the percentage is more than relevant, considering the fact that most people find a spouse in school, at work, in their circle of friends and so on. But for those who didn’t, the online dating scene becomes a breath of fresh air. Why should anyone use online dating? Well, like the digital age helped all of us broaden our world, social sites can help its users to broaden their circle of acquaintances, get in direct contact with people that share at least one thing in common - the search for a partner to share all life's joy and so on. Social networking sites should not be looked at with fear, but exactly as they are: tools that can make your life easier. 2. Don’t be in a hurry to conclude on someone. 3. Try to be honest; this will determine how far you can go. 4. Embrace technology - Some avoid online dating, saying they prefer the old fashion. But let's don't forget that these two don't exclude each other. The new digital online dating can only help broaden the stage. Technology helped turn our world into a global village, so make the best out of it, even when it comes to dating! 4. Share something personal. Think of something personal to share with your spouse. It does not have to be a big thing, but it does have to be something important to you. Take some time discussing your day, your work, your goals, etc. And do the same with your spouse. Be sure to listen to what your spouse is telling you. Sharing small things with each other helps to connect you. 5. Plan something special. Everyone likes to feel catered to or taken care of. Do that for your spouse. Plan a special meal, activity, event, outing, etc., designed to make your spouse feel special. 6. Talk on a regular basis. You can have a fresh and interesting marriage. Use these seven tips for getting the spark back to your marriage. So you have a special someone online and you would really want to get to know this person more. You are actually several miles away from each other and the only thing you can do is date online for the time being. How should you act? How must you carry out a successful date with that special person you have? Below are several online dating tips that you need to consider. It is important for any dating relationship to have both partners be themselves as much as they can. Because it is an online relationship, the only thing you can do to show your real self is by speaking the truth. There are many online relationships that fail from the start simply because one person in the relationship did not have the guts to be real. In an online relationship where the two people involved may be a thousand of miles away from each other, time is an important factor. Find a common time that will be convenient for the both of you. if it happens that both of you are at opposite ends of the world, find a time wherein you can be both present in front of the computer and can spend the time together undisturbed. If it is internet dating, the need to use the email and the instant messengers that can be freely accessed online will be important. Find a common medium that both of you can access. It is important to find one so that you can both have a conversation continuously and without much hassle at all. You can also gain access to a webcam that you can use during chatting. In that way, both of you can see each other. You can also both use a common social network online to carry out your dating. There are various social networking sites online like Facebook etc that you can register on so that you can both be up-to-date with each other's statuses, photos, videos, and such. There are also numerous things you can do online together during a date. You can find songs to sing, movies to watch, or simply chat with each other. Creativity is important when in an online date. You can choose to make the date more special by talking about a common dinner date that you can have together during your webcam or video call chats. Online dating can be very interesting and real. It is up to you and your date to find ways in order to make the date a special one each time. There are even numerous instances when an online date can actually replace an offline one. Who knows? You might find that special someone by dating online. Following the various online dating tips above will help you greatly in making that date a really special one. If you are willing to Work - Long Distance Relationship Will Work too. Think about this-even 10 or 15 years ago, long-distance relationships were fully dependent on telephone calls (usually from a landline!) or letters...not email, but old-fashioned snail mail. Think of how far we've come? In the past, this may have felt more like a burden, but with all our technology and communication nowadays, distance love is not only possible, it is even enjoyable! Because of technology tools (like Facebook, instant messaging, mobile phones, Skype, etc. ), long distance relationships are working these days, and really well. Not only can you call or text your partner almost anytime, but you can see them through video chat. And, if you work an office job or are online a lot, you can stay in almost constant communication! That takes a lot of strain out of this type of connection, because even though you are not together in person, you can still feel like you are close to your partner. So if you're wondering if a long distance relationship can work, the answer is a resounding yes! A woman narrated how she met her husband "When we got married," she said, "we really only knew each other from letters. We didn't have the fancy stuff you have today where you can actually see each other; we just used our imaginations. So, if we could do it without even seeing each other, you guys have it made!" She's right. If they can do it with plain old letters, just think of what is possible today with the technology we have! Contrast what the woman had with today's long distance relationships! You get to see each other, hear each other, and communicate almost all the time, which makes the distance so much easier to bear. A big key in any relationship, distance or not, is communication, and thanks to today's tools, contact is easier than it's ever been. Still, all these great tools don't guarantee the success of distance love. The only chance of success can come from both partners putting in equal amounts of trust, communication, acceptance, and a willingness to change for the betterment of each other and the bond. So don't worry on whether long distance relationship works, just put the effort in and you'll get the enjoyment out! Long distance relationship advice is easy to give, but tough to implement as it takes a lot of effort and discipline. Those who are in this kind of relationship will know this better. In this article, I will give you some tips and pointers on what you should do and not do in this type of relationship. If you have the will and desire, you can conquer the distance by heart and make the relationship filled with fun. In any relationship communication plays a vital role, more so in a Long distance relationship. If communication channels break down, it does not take long for the relationship to break down. Use every possible medium available for communication such as telephone calls, instant messaging, communicator, Skype etc. Modern technology has so many options, that it cuts down the virtual distance. Use the channels effectively to keep your relationship on track. Most long distance relationships breakdown due to lack of meeting each other. Distance sure makes the heart grow fonder, but at the same time remember, prolonged out of sight makes one go out of mind too. Meet each other at regular intervals of time. This will help you both catch up on happenings in each other lives, plus the anticipation of meeting will not only generate excitement, but will give the hope and motivation to keep the relationship going. Springing a surprise on your partner, will add the zing and pizzazz to your relationship. The surprise could be sending gifts without any occasion, or just turning up without prior hint. Trust plays an important role in all relationships. Do not abuse the trust placed in you by your partner. Just because you are in a long distance relationship does not mean you can play around. Keep the normalcy in the relationship as much as possible. Exchange pictures, videos, anecdotes etc. This may not reduce the physical distance, but will sure reduce the distance between hearts. Being in a long distance relationship does not give you the license to cheat. By doing so, you will not only put your relationship at risk, but will break the trust of your partner and can cost you your relationship. Do not treat your relationship casually. Just because your partner is not around, does not mean you can manipulate and take arbitrary decisions without discussing with your partner. Treat your partner fairly. There should be no scope of suspicion in a long distance relationship. To have a successful relationship, trust each other whole heartedly. If suspicion gains entry, then it will be beginning to an end of what could have been a beautiful relationship. 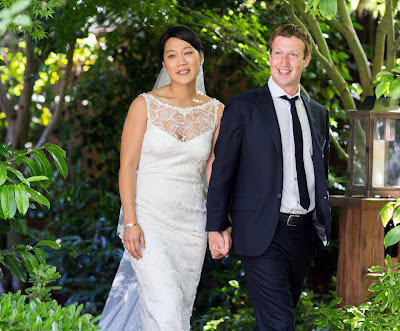 The founder and CEO of facebook, Mark Zuckerberg marries Priscilla Chan his girlfriend of nearly a decade. The wedding took place on Saturday, 19 May, 2012 at his Palo Alto, California home with about 100 surprised guests who thought they were invited to a party to celebrate Priscilla’s graduation from medical school. Facebook’s chief operating officer Sheryl Sandberg and other attendees were told after they arrived that they were not mere party guests but wedding guests. Priscilla Chan and Mark Zuckerberg now have their facebook status updated “married”.